A delightful English cathedral city built on a flat plain; watered by the rivers Bourne, Nadder and Avon (Hampshire). The original settlement sprang up around the ramparts of an Iron Age hill fort, some three miles to the north of the current city. The Romans strengthened the fort and called it Serviodunum. When the Normans arrived they they built a small castle and a cathedral here, renaming it Sarum. However, during the 13th-c, the location was found to be too exposed and lacking in a good supply of water. Bishop 'Herbert Poore' decided to build his new cathedral in the rich plains to the south. He died before he could carry out his dream but his brother Richard (who succeeded him) began to build the new cathedral in 1220. Construction took the remarkably short time of 38 years. Today the cathedral is noted for its early English pointed arches, tall windows and elegant spire - one of the tallest in Europe at 404 ft (123 m). Salisbury (pronounced "Sols-bury") town centre has a large market square and a first class shopping precinct. Within the centre are many good bookshops, antique shops, restaurants and eateries, plus an aspiring theatre and a lively arts scene. Many of the older buildings have been refaced to appear modern. Such as the contemporary facade of the Odeon Cinema, which covers a 15th-c foyer, that was once the home of a wealthy merchant named John Halle. The city streets are laid out in a grid pattern, centred around the market square, echoing its medieval roots. Place names often identify the ancient trades that were once plied there, such as Ox Row, Fish Row and Butcher's Row. The narrow streets and lanes are packed with historic buildings, half-timbered houses, bow-windowed shops and ancient gabled inns. 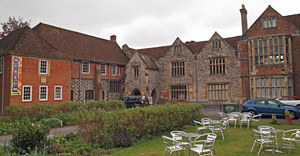 Such as the old George (where Pepys once slept), and the King's Arms, where Royalists plotted the escape of Charles II following the Battle of Worcester. Other fine half-timbered buildings include the 16th-c Joiners' Hall in St Ann Street, and two 14th-c coaching inns, the Haunch of Venison and the Rose and Crown. A magnificent 18th-c Guildhall stands at the corner of the market, near to which is the lovely 700-year-old church of St. Thomas. Weekly open-air markets have taken place here on Tuesdays and Saturdays since 1227. Several ancient medieval bridges span the Avon as is flows through the town, which is later joined by the River Nadder, to the south, via tranquil water meadows. The cathedral and its Close (a large enclosed green) create one of England's most prestigious precincts, accessed via several medieval gateways. A particularly fine example is St Anne's Gate. It houses a room in which George Frederick Handel is said to have given a recital. The Close itself is backed by a host of magnificent 18th-c houses. The grandest of which is Mompesson House (National Trust), built in 1701. It is stone-faced building with a number of rooms furnished in period style, with some of the most awe-inspiring plasterwork. To the south of the Close stands the 13th-c Bishop's Palace. The view of the cathedral from the palace gardens was famously painted by John Constable (on display in the Victoria and Albert Museum). The plain around Salisbury is the largest area of grass land in Europe. It is noted for its many ancient and prehistoric sites, including Stonehenge. Built between 1220 and 1258, the Cathedral is one of Britain's finest surviving examples of Gothic architecture. The 404 ft (123 m) tall spire (the tallest in England) is one of the most painted subjects by water colourists. The west front, the last part of the building to be completed, is the most lavishly decorated. It has row and rows of statues set in niches. Inside, graceful columns of Purbeck stone line a high-vaulted nave, and its many tall windows create an airy open atmosphere. The nave is rich in monuments, tombs and effigies. The oldest tomb is that of William Longespee, the third Earl of Salisbury, who witnessed the the signing of Magna Carta by King John in 1215. 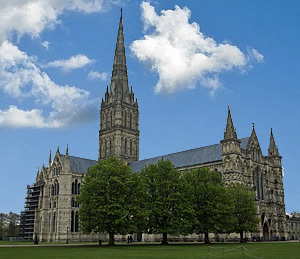 The copy of the Magna Carta he brought back to Salisbury is still held in the cathedral library. One of only four surviving originals in the UK. with scenes from the Old Testament. The chapter house is overlooked by some of England's finest cloisters, with huge cinquefoil openings. In the north transept can be found the oldest working clock in England (circa 1386). It has no dial and only chimes the hours. The cathedral is situated in a walled close covering one third of a square mile; the largest of its kind in England. It contains a range of fine ecclesiastical and private residences and several museums open to the public. Opening times: daily 7.15 am to 6.15pm Admission by Donation. Located in one of finest (Grade I) listed buildings in Cathedral Close, opposite Salisbury Cathedral. Exhibits cover the social history and ancient monuments of South Wiltshire from Stonehenge to Old Sarum. Collections cover prehistory, Romans and Saxons, Medieval Salisbury. Exhibits include the Pitt Rivers Collection, local glass and ceramics, art and costume. A magnificent Queen Anne house with stucco ceilings, fine plasterwork, pedimented door cases, carved oak staircases and many fine art paintings. It also contains a large amount of original 18th-c furniture and decorative pieces, including a collection of drinking glasses. There is a beautiful walled garden at the rear. 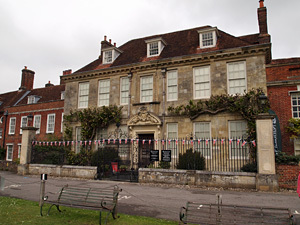 The property was used as a set in the 1995 film of Jane Austen's Sense and Sensibility. This historic 13th-c banqueting hall, located near Salisbury Cathedral, provides an interesting insight into Salisbury's extraordinary past. The beautiful stone built hall retains many of its original features, including high leaded windows and a fine timber framed roof. Visitors can enjoy a 40 minute film about the history of Salisbury. arrangements for the Domesday Book to be compiled. Sarum is an interesting place to explore, with earthworks and ramparts, dotted with military and ecclesiastical ruins. It covers around 56 acres, it has been preserved as an archaeological site.